The Pediatric Brain and Spine Tumor Support Group provides emotional support and functions as a bridge between the medical and emotional needs of the patients and their families. 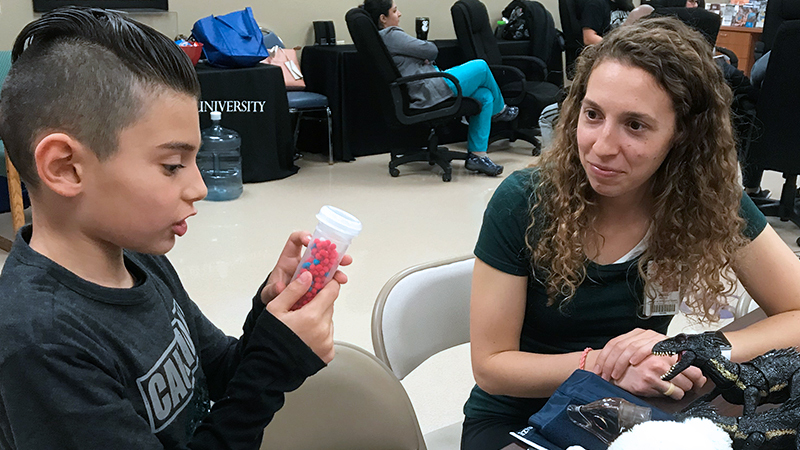 The group was initiated by Dr. Tanya Minasian, Loma Linda University Children's Health neurosurgeon, and is facilitated by the SBH Child Life Specialist MS program and clinical directors, child life specialist graduate students, and doctoral psychology students. During the group, the children and their caregivers are divided into two groups. Topics covered in the adult cohort include mindfulness, IEP/504 plans, and issues related to PTSD. The children's group provides hands-on therapeutic art interventions, medical play, and coping techniques. The group meets on the first Monday of every month at 4:30pm until 5:30pm at the Professional Plaza, Suite 109. I am so grateful to be a part of helping these kids and their parents as they go through this difficult medical journey. It is a unique opportunity to be able to reach out to these kids through medical play and hands-on experiences to help them process and work through their feelings. For more photos from this amazing support group, click here. ‣ March is Child Life Month! Click here to read more about what our students and faculty are doing to celebrate.